A MINIMAL STREET SNEAKER INSPIRED BY THE ARCHIVAL STYLE OF THE ’80S-ERA ZX SERIES. Simple and modern, the ZX Flux is a descendant of the iconic ZX 8000 running shoe. These men’s / ladies shoes have a one-piece mesh upper with welded TPU 3-Stripes. With the Adidas ZX Flux, Adidas Originals finally made it and resurrected the ZX 8000. The new sneaker has the same outsole like the running classic from 1988 and features the revolutionary Torsion system. 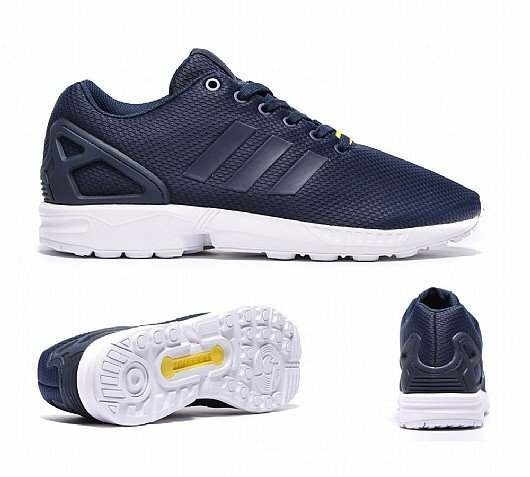 Unlike the classic ZX-models, the upper of the new in interpreted Adidas ZX Flux-series is built up simple and combines a one-piece upper with a heel cage. A must have for the modern fashionista! View our full adidas collections here.